This is a commercial ( international ) web site. There are NO COOKIES on this specific html web page. This is to comply with United Kingdom cookie law. This is to comply with European Union cookie law. This is to comply with any other law that assumes that since web browser software in general force users to "accept cookies" by default, that it is the web designer's responsibility to supply a web page that is without any cookies. This is a commercial site. We use tracking cookies. Whatever type of tracking cookies that we decide or that we allow: we might use. Consider them all to be potential on this site. If you are so cookie aware that you want to know, then look at our webpage source. We think that most major internet web browsers supply the user (you) with an option to automatically stop or automatically reject any and all (or selectively some) website cookies. then this one page is set up for you and you are required to use this page for all of your business with us. Product information on this page: none. Price list on this page: none. Email contacts on this page: none. But, there are no cookies on this page! If you want to do business, then go to our home page and do business. Set your browser to accept cookies or not. And proceed with business. 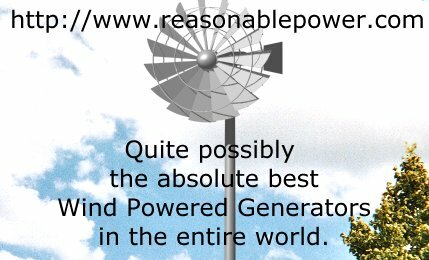 Here in Maryland, USA, the state legislature has told us that if an individual produces electric (with up to 30KW of a grid-tied wind powered generator), and sends that electric into the electric utility grid, that Maryland state law forces the electric utility company to pay that person 100% FULL GENERATION RATE (excluding transmission and distribution) for that electric. * You should verify these laws yourself before acting upon this. Also, you might be shocked at the price that high-carbon-footprint manufactuing facilities are paying for RECs (Renewable Energy Credits). Seriously, you might thank us for telling you about it. We manufacture and sell Wind Powered Generators. YES ! Money from the wind. That is radically, seriously, phenomenally, "green". Yes. You do have permission to use a direct link to this page.